Lucked out finding this place! Our bodies were in rough shape after two days of hard skiing and we were looking for a good massage to get us back on the slopes. We happened to find Melissa and she was able to take us in that day. Her room is a little oasis in the upstairs of a greenhouse. She has obviously done this for years as she managed to work on my sore muscles without making me cry. I loved how she kept a hot pack on my spine as I am usually cold at the start. Really nice touch. Will definitely come back here on out next ski trip!! Melissa, you did a fantastic job working on the sore spots and providing a total feeling of relaxation during my massage last Sunday. I am certain that the next two days of awesome skiing would not have been possible without your attention to detail ! You are real pro. My massage was a real value and I enjoyed every moment. Thanks so much for a great experience Melissa. See you next time. After successive back injuries my doctor recommend PT and massage therapy. I suffer from degenerative disk disease (basically arthritis) and have an issue with movement between my L4 and L5 disk. Any serious impact activities like downhill skiing and mountain biking left me in a lot of discomfort. It also impacted my ability to travel for my work. Even short trips to Denver caused soreness and pain. Today I am more active blending a routine of walking, cross country skiing, and swimming. I even got back on my downhill boards trying to keep up with my kids. I travelled to Europe with out any major discomfort. Life is getting normal again. One key ingredient to my improvement is working with Melissa Dawe with regular massage. She spends time understanding your issues and carefully tries new techniques to speed your recovery. For me, working on my hamstrings and hip flexors really helps. She also gives you tips on exercises and even simple aids like using a tennis ball to self massage and stretch with when you're on the road. Anyway, I highly recommend Melissa based on her expertise and the care she takes with her clients. Prior to my Thai Massage appointment w/Melissa, I felt muscle tension, stressed from work and the need for some peaceful "me time". After my hour and a half meditative Thai massage session, I felt calm, balanced and my muscle stretched. Thai massage is a wonderful way to restore joint movement, clear one's mind and enjoy some healing time. I have moderate scoliosis and arthritis in both my neck and back. My pain and stiffness was preventing me from doing some of the activities I love. Melissa at Namaste suggested Thai massage and I love it. It's like a cross between stretching and massage. I feel like I have my own professional sports trainer and a massage therapist. My flexibility and aches and pains have improved. After every Thai session my posture is better, with my back straighter and my shoulders more open. I just wanted to let you know that I felt great after my massage last week! Thank you so much. You worked on the areas of my concern and used just the right amount of pressure to relieve the pain. I did not have soreness after the massage. I would highly recommend you to anyone visiting or living in the Silverthorne area!!! Melissa is an amazing therapist with both healing hands and spirit. I am a recovering throat cancer patient with extensive radiation damage and scaring in the musculature of my neck and face. I came to Melissa with sclerotic cramping and stiffness, which was starting to lead down a road to chronic problems and disability. Through the course of 8 treatments, she used several techniques in massage to break up the scar tissue and relieve both pain and severe cramping. Her healing touch allowed me to resume my life and probably saved my career. Thank you for the incredible care!! I'd recommend Melissa Dawe. I had a massage from her just yesterday. Wonderful atmosphere and she got everything that ached and made them feel better. I slept so well last night. Some massage therapist it just feels like they are chasing your tension around your body and you leave as tense, just in different places. She got rid of the tension and used different oils at different places for a few problem areas I have. It was great! I had the pleasure of having a massage with Melissa about one year ago when I was in town on vacation visiting friends. I had been suffering from constant pain in my right leg, even when just sitting. I explained the extent of my pain to Melissa and she, after asking questions about all the physical activities I do, assessed where it was originating from. She worked on me for the complete hour I had booked and an additional 30 minutes until I was literally pain free. The massage was so thorough and included the best deep tissue work I have ever had. Melissa was in tune with where all my aches and pains were and seemed able to just zero in and work it all out. I walked out of that massage a new person and the leg pain was relieved for one year. I have had hundreds and hundreds of massages in my life but never one that gave me these kinds of dramatic and much-needed results. Melissa Dawe became my massage therapist almost a year ago. I used to think a massage was a luxury enjoyed only when on vacation and splurging at a spa. Last year, at a time when my body was crying out for help with frequent headaches, backaches, general lethargy and stiffness, a friend mentioned Melissa. Unlike any other massage therapist I experienced in the past, Melissa was immediately attentive to my needs. After only a few sessions, it became apparent that her magical hands had to be a part of my routine. My consistent therapy has brought about a happier body and when any "issues" arise, Melissa works to find the problem and the solution. It is due to Melissa's knowledge and my consistent massage sessions with her that I truly enjoy more of what the Colorado Rocky Mountain life offers. I now believe that massage therapy brings about better circulation, lengthened and relaxed connective tissues and a general, overall well-being. I am writing a quick note to express my sincere appreciation for your excellent efforts in providing me with two exceptional massages. Thanks for helping me to recover from my hamstring problem. Simply said, you're the BEST! I have high praise for Melissa for introducing me to the healing power of massage therapy. I suffered for years with carpal tunnel, neck and back pain. Melissa's skill as a therapist shows in her ability to pinpoint and treat problem areas. Before long I was pain-free and able to get my life back. I was able to stop taking painkillers. Her concern for her clients' well-being, to truly help heal them, speaks to her integrity. Thank you Melissa! Melissa is an absolute professional! I came to Melissa after having a severe car accident that left my back in constant pain. Through my work with Melissa I have been able to go from having constant spasms and pain to now being able to play golf numerous times a week pain free. The spasms and muscle tension that had become part of my life for many years thanks to Melissa have disappeared. I highly recommend Melissa to anyone looking to improve their health. After my *very first* massage session with Melissa, I knew I had found a new, crucial part of my training regimen. As a competitive cyclist, aches and pains are a part of my life. The sports massages I get at Namaste not only help me prevent injuries by keeping me flexible, they absolutely help my body heal and feel better -- which means I can get back out there and ride better. I've been to lots of massage therapists. Many of them push and dig far harder and cause twice as much pain -- but none have come anywhere near to providing the relief and sense of well-being that I get from one of Melissa's massages. Melissa was exceptional! My massage with her was the best I've ever had!! I am so so so soooooo glad I found Namaste!!!!!! Melissa's understanding of anatomy, her intuition about various aches and pains, and her ability to recommend additional therapies, options, and treatments outside of her massage practice to help with overall well-being is just hands-down AWESOME. I've had massages in the past where I've explained my issues, but my massage felt generic and didn't address the concerns I came in for. I absolutely love that all of my massages at Namaste are complete customized to me every single time I come in. I strongly, strongly recommend that anyone (whether visitor or local!!) in the Summit County area that's looking for an effective, fantastic massage pick up the phone and call Melissa at Namaste Bodywork. They won't be sorry!! Massage is an excellent way to ease the symptoms of altitude sickness. However, it's still important that, during your visit, you take good care of your body. Remember, you're at 9,600 ft (and above!) in elevation here in the mountains of Summit County, Colorado. 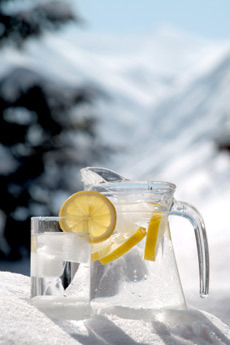 Drink lots of water - it's important to drink much more than you normally do. Do your best to limit your intake of salty foods, caffeine, and alcohol. Consumption of these items dehydrates the body and often worsens the symptoms of altitude sickness. Make your appointment for a luxurious therapeutic massage at Namaste today. Call Namaste Bodywork in Silverthorne, Colorado at (970) 393-2636 and set aside some time just for you--for pampering, healing, and rejuvenating.